I’ve lost a lot of weight since 2014. 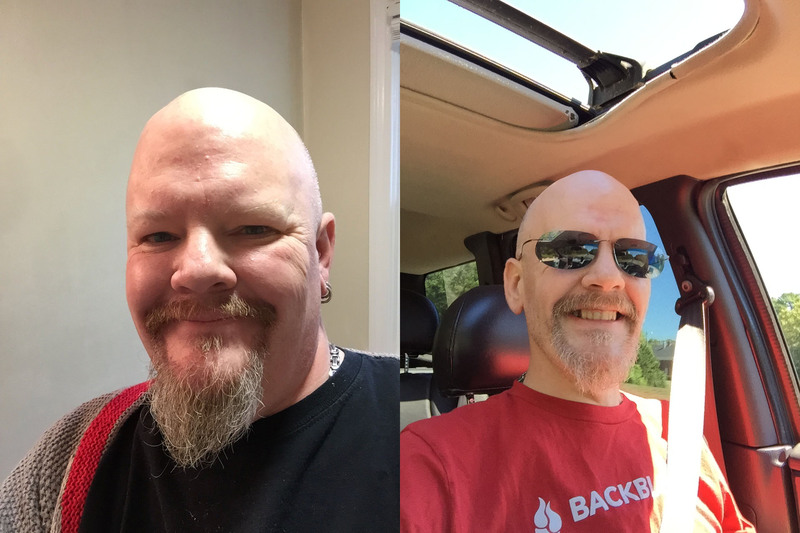 I’ve been pretty open about what’s happened to anyone who asks, but this weekend marks a date with special meaning: It’s my second “surgiversary” – the date I had gastric bypass surgery. Here are two photos; one from about that time and one I took last month. I had a procedure called Roux-En-Y done in November 2014. You can read up on it if you’re interested. It’s a bit different than the popular sleeve you hear about: My stomach was fashioned into a small pouch which then bypasses the first portion and part of the second portion of my small intestine (hence, bypass). It restricts the amount of food I can eat, but it also restricts nutrient absorption – so I don’t get the full caloric benefit of what I’m eating, either. The story starts In 2012. That June, I got horribly sick on the drive back from a weekend getaway with the kids. My left foot began to swell as I was driving home; by the time we got back, it was ugly and purple. I hadn’t noticed at first because I have peripheral neuropathy in my feet. It’s a side effect of diabetes – I’d been diagnosed with Type 2 Diabetes in the late 90s. I’m also a typical guy – really good at ignoring problems you should deal with straight up until they turn into full-blown crises. My wife certainly understood the emergency. She insisted on taking me to the hospital, where I spent the next week and a half. Within hours a surgeon had been summoned to cut open and drain my foot: I’d gotten blood poisoning. Whether I’d actually get to keep my foot was a mystery until later that year. Ultimately I would need months of specialized wound care and nearly round-the-clock intravenous antibiotic injections (self-injected through a central catheter line in my arm). I realized after that experience that I was going to die from being fat and that it was my own fault. I’d already caused my wife and kids enormous pain and suffering with my hospital stay and recovery. I couldn’t bear the idea of becoming an invalid or worse. I was on three different meds to control blood sugar, and they were doing a losing job. I was taking a pill to control high blood pressure. I used a machine strapped to my face to help overcome the effects of sleep apnea. I had to inject myself with hormone replacement because fat can kill hormone production, too. I was also gobbling down antidepressants, partly to deal with some of the side effects of the drugs I was taking. I’d struggled with weight loss for years. And I’d finally come to understand that without doing something different, this was how I was going to die. I didn’t want that to happen. In June of 2014 I enrolled in a gastric bypass surgery program. The place I went to requires patients to go through a psychological screening process and meetings with nutritionists so you understand what to eat, and more importantly, why you want to eat in the first place – and what to do about it when “head-hunger” is speaking to you. From start to finish it was a six-month program. I went to meetings and appointments, had blood drawn and X-Rays done, drank lots of water, exercised, watched what I ate. Mostly. And then, on Thursday morning, November 13th, I went into the operating room for the Roux-En-Y procedure. I walked out of the hospital less than 48 hours, on Friday night. All told, my initial recuperation only took a few weeks. The surgery is done laparoscopically so I had only about six abdominal incisions to care for. I had to stick to a liquid diet for several weeks – I still can’t eat jello or pudding very often without dropping into an existential funk. At the time I enrolled in the weight loss surgery program I weighed about 325 pounds. I wore 3X shirts and had a size 48 waist. I had to lose some weight prior to the surgery: I was about 300 pounds when they wheeled me into the OR. Since then I’ve lost well over 100 pounds. Jokes about “being half the man I used to be” are a bit off – I’m actually only about two-thirds the man I used to be. I’m down to an L or XL depending on the cut and a 36 waist. So I’ve lost a foot around my waist. I didn’t take measurements on my arms, legs or neck, but those are all a lot thinner too. I don’t take medicine for blood pressure or diabetes anymore (my latest A1C came back in normal range), don’t use a CPAP for sleep apnea and my hormone levels are fine now. I only take a pill for cholesterol, plus a handful of supplements as required by the digestive changes I’ve undergone. I also walk, run and do some light strength training to exercise – things I never did before. The Apple Watch has made it a lot easier to keep track of when I’m supposed to take supplements, and is handy for tracking activity too. The common fallacy is that getting gastric bypass surgery is an easy fix. It isn’t. I’m going to be living with the ramifications of this for the rest of my life. I can’t eat bread, rice or pasta most of the time without getting horribly sick. My tolerance to certain seasonings has changed. I used to love spicy and aromatic foods, and still do, but can’t tolerate some of them nearly as well as I used to. I’ll eat something that smells delicious, it hits my stomach and I’m running to the bathroom. What’s worse, I still can’t predict when that will happen. I’m still learning how my body works. Some foods that I used to love, including some animal proteins (beef and pork, for the most part), are undigestible to me now and make me horribly ill.
What’s more, what’s fine one day may not be the next. I’ve gotten three days of heartburn eating the same turkey meatballs I’d made the night before and eaten with no problem. There are also physical problems caused by the sudden and dramatic loss of weight following gastric bypass surgery. I’ve lost muscle mass in addition to fat. I have loose, hanging skin. My nails became brittle and tore easily until I started taking a biotin supplement (yet another supplement). I wouldn’t trade it, though. I feel like a new person most days. I feel better. Every so often I talk with someone about the surgery. They’ll often tell me about their friend or relative who had gastric bypass, and how they gained some or all of the weight back. First, most patients will regain some lost weight, that’s simply a matter of fact: The human body is nothing if not adaptable. Second, it’s not helpful or supportive, even as a negative example. I don’t know anything about that person or their journey – what they did to lose weigh, what surgery they had, and what they’ve done to keep it off. The most important lesson I’ve learned along the way is that having your stomach operated on doesn’t change how you think one whit. And when it comes to food, how we think is at least as important as what we do. I used food as a coping mechanism, for masking feelings, for soothing myself, for comfort. I ate calorie-dense foods with little nutritional value, and would rather pound down quick carbs over proteins and fresh produce – especially if salt or crunch was involved. I still find myself tempted around what we call “slider foods:” crackers, pretzels, chips and other foods that slide down easily but offer little or no nutritional value. I often find myself in front of the kitchen cabinets, looking for something to graze on. That’s when I have to ask myself if I’m feeding my stomach or feeding my head. If it’s the latter, I try to get a glass of water and move on. Sometimes I don’t. Sometimes I eat those chips, or that slice of pizza, or something else I know I’m not supposed to have. And it’s okay. Because I can stop myself before it’s an entire pizza that I’ve eaten, or an entire bag of chips. To that end, nothing changes after you have gastric bypass surgery. If you have problems with food, you’ll still have problems with food. That’s why it’s so vitally important for most of us to combine weight loss surgery with effective therapy and group support after the fact. Gastric bypass surgery has been a life-changing, life-altering experience for me. It’s given me a very important tool to help maintain my overall health. Every day, what I choose to do with that tool is up to me. Previous PostThe new MacBook Pro isn’t for you. Shut up already. Very awesome on keeping it off.